Russell L. Stockard Jr., Ph.D.
Office Hours: On sabbatical leave Spring 2018 and Fall 2018. 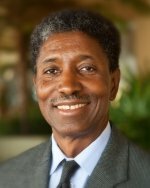 Dr. Stockard's interests include new media, particularly online marketing and use of new media by diasporic communities of color; critical discourse analysis; sports-related marketing and media; media management; cultural studies; environmental communication; tourism; and Caribbean and Latin American studies. His previous professional experience includes satellite communications, telecommunication and cable television. He is active in the Caribbean Studies Association, belongs to the International Communication Association, and the American Association of Geographers. He formerly served as president of the Southern California Chapter of the National Association of Minorities in Cable. He has done broadcast journalism in Costa Rica and for KCLU-FM, a National Public Radio affiliate, located on the Cal Lutheran campus. A.B., History, Harvard College. A.M., Romance Languages and Literatures, Harvard University. Ph.D., Communication, Stanford University. M.B.A., Marketing, University of California, Los Angeles. Proposal writing; environmental communication; disaster communication; media studies; cultural studies; globalization; photojournalism; feature and opinion writing; creative writing; scriptwriting; audio and video production; corporate communication and marketing communications; community relations; quantitative and qualitative research, including research and questionnaire design and focus group moderation; Caribbean and Latin American Studies; French, Spanish and Portuguese language proficiency; beginning Haitian Creole working knowledge. The future of vulnerability and sustainable development in Haiti: Disaster, community, innovation and information, Boufoy-Bastick, B. and Chinen, S., eds., Contemporary Caribbean dynamics: Re-configuring Caribbean culture, Ian Randle Publishers, Kingston and Miami: 2015 ISBN 978-976-637-860-8. Ecocriticism and Postcoloniality in Digital Diasporas Post-9/11 and Katrina,chapter in Creoles, Diasporas & Cosmopolitanisms: The Creolization of Nations, Cultural Migrations, Global Languages and Literatures, David Gallagher, (ed. ), Academica Press, Bethesda, 2012. Subverting Social Vulnerabilities and Inequality in Disaster Survival, co-authored chapter with R. L. Stockard and M. Belinda Tucker, Ph.D., in Narrating the Storm: Sociological Stories of Hurricane Katrina, Danielle A. Hidalgo and Kristen Barber, (eds. ), Cambridge Scholars Publishing, 2007. Paperbound edition of the volume was published in September, 2011. The Networked Poetry of Time, Space and Connections: Globalization, Glocalization, Community Capital and the Online Black Diaspora. Presented at the Second Annual AfroGeeks Conference, the University of California, Santa Barbara, May 19-21, 2005. Published in Anna Everett and Amber J. Wallace, (eds. ), @froGEEKS: Beyond the Digital Divide. Santa Barbara: The Center for Black Studies Research, University of California, Santa Barbara, 2007. The Social Impact of Gender and Games, in E. Trauth (ed.) Encyclopedia of Gender and Information Technology, May 2006, Idea Group Publishing. Gender, Race, Social Class, and Information Technology, second author with Myungsook Klassen, in Trauth, E. (ed.) Encyclopedia of Gender and Information Technology, May 2006. Hershey, PA: Idea Group Publishing. Dimensions of Sustainable Diversity in Information Technology:Applications to the IT College Major and Career Aspirations among Underrepresented High School Students of Color, first author with Ali Akbari and Jamshid Damooei in G. Trajkovski (ed. ), Diversity in Information Technology Education: Issues and Controversies. 2006. Hershey, PA: Information Science Publishing. Broadening Participation in Computing, National Science Foundation, 2001-03.